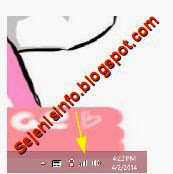 It seems like this post is long tips on tips and know this because this how to share internet connection from android connection to a laptop via wifi, but this blog is too long didn't update. For now use a smartphone and a laptop was now widespread and have become daily consumer goods like eating every day because the people without a smartphone these days maybe they're upset, and now the internet is the everyday needs as well, then if we were less satisfied using browsers on Smartphones such as the android browser smartphone but less satisfying because of the size that is too small, so if you have a laptop with wifi is available then we can share the internet connection from android to a laptop or PC that has wifi connection. Previously I've been posting about how to share internet connection from android phone to laptop/pc by using the USB cable. With Wifi can be easily used, we can share the Internet or share files or folders of data from one device to another device without the need for cable, because before wireless wifi existing like the transfer of the data files or folders and internet sharing can only be done through LAN cable. Using the cable will be a little untidy in the room look around, especially if there are very small in a room and multiple PCs connected to the cable looks very untidy if the person who set up the cable layout is messy, and sometimes we would stumble by cable located under the floor. Currently there are many who use the wired LAN and it is not a little, but it is appropriate for large companies to replace wired cable networks with wireless Wifi networks because it will be more profitable and more look good. - Network SSID fill with a wifi hotspot name up to you. 3. 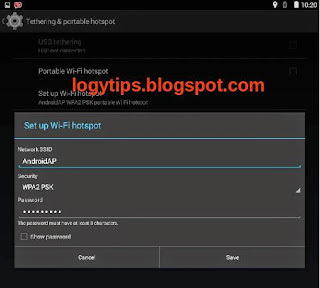 After filling wifi hotspot name and password press back or return to the previous menu and press or checklist at the Portable Wi-Fi hotspot, the WiFi hotspot is already running android. 4. Now onto the laptop, set that on the laptop to a wifi network is already enabled, can be viewed on the existing laptop taskbar at the bottom left there is a picture such as a monitor or as an image signal, click and scan for wifi android wifi if your name has been detected, connect by clicking on the connect button and enter the password that has been created in android earlier. In the picture below is the view laptop wear wifi connection windows 8, windows 7 the same way as are the windows xp I think. 5. Open the browser on the laptop and try to test open google for example if it is connected it can open google. Wifi is a tool that can replace the current LAN cables, in addition to more efficient because it will look better, Wifi laptop with android would be better to also be used to copy and paste files or folders will be lighter and does not need to be complicated with a cable that looks annoying. 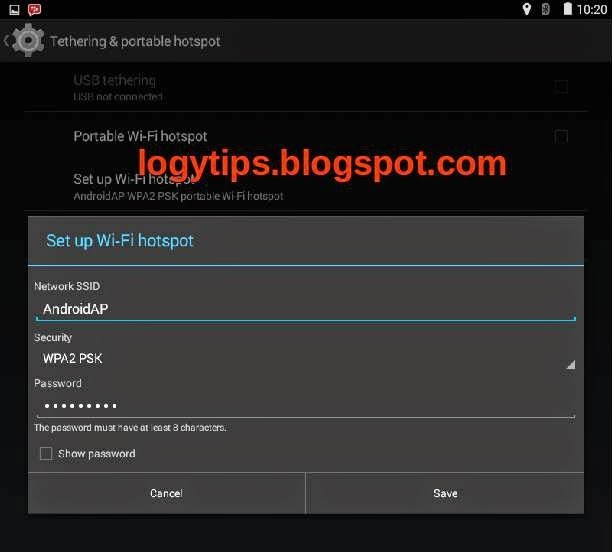 To connect the android phone to other android phone can we use and with steps above the different only a little active hotspot on android phone and turn wifi on other android phone and then scans wifi around after that you might as well know :). For that on a laptop or PC / computer no wifi then can use the usb cable to see how here. I am regular visitor of your blog your information is very nice. I am waiting of your next update about Portable Wifi Hotspot . Using such device is highly ideal while traveling or in urgent situations. 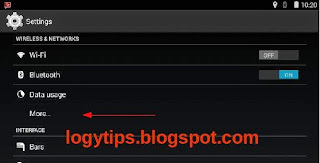 I am regular visitor of your blog post very nice. I am waiting of your next update about Portable Wifi Hotspot . Using such device is highly ideal while traveling or in urgent situations. The Netgear Genie Smart Setup wizard enables you to setup your Netgear extender through the www.mywifiext.net Web browser of a device that's connected to your current Wi-Fi network. You need to know some details about your Wi-Fi network -- such as the network’s password -- to complete the configuration. Since the extender pushes your current Wi-Fi network’s signal beyond its current limit, you won’t have to worry that the wireless signal will drop unexpectedly at a critical moment, such as submitting an assignment online. 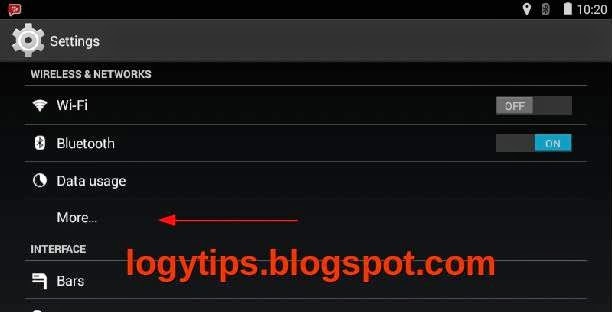 How to configure your NETGEAR Router & Extender for cable internet connection with Smart Wizard mywifiext.net When you try to access the website www.mywifiext.net/ to set up your wireless extender, you might receive an error message or be unable to connect to the site. This can occur because www.mywifiext.net/ is not a regular Internet website. It is a local web address used to open the settings (genie or Smart Wizard). Login and create account at MYWIFIEXT.net setup website. Solution for connecting issue and reset username and password. interesting to visit your site.